Subscribe to African Journal of Midwifery and Woman's Health Magazine. 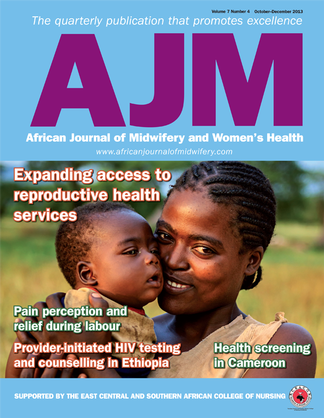 AJM African Journal of Midwifery and Women's Health is a quarterly peer reviewed and evidence based journal for midwives and nurses. It is aimed at those who wish to keep up to date with developments relating to midwifery and women's health in Africa. Subscribe to AJM today and benefit from Discussion on the complexity of midwifery and women's health in Africa Focus on maternal and infant health issues faced by different countries across the continent Topical debates on clinical and professional issues Interested writers from outside the continent and within Africa, providing African midwives and nurses with a new voice Research and education, encouraging advanced skills, knowledge transfer and academic discussions If you wish to remain informed on the latest developments in African midwifery and women's health, as well as further your professional development, then AJM is for you.. African Journal of Midwifery and Woman's Health Magazine subscription.